Among the many inviting Caribbean resorts, here’s one that stands apart. The rock underfoot is calcified coral, the ferns prehistoric, barely changed from when this island was new some 40 million years ago. The air smells of salt and earth, the tranquility enhanced by the shoosh of palm fronds, the skitter of lizards, and the beat of distant salsa. The trail is lined with royal palms, native almonds and Castilla elastica, the hairy tree that bleeds latex. It wanders among eleven clear-water lagoons — called ‘eyes’ by the Taino Indians who populated the island of Hispanola before the arrival of Columbus — the water flowing underground from the mountains on its way to the sea. Ten of the lagoons are protected, but a dock at the eleventh invites visitors to slide in among the fishes and turtles. As I lie in the lagoon, eyes closed, one foot in the water, the sun and breeze warm and cool my skin. The trail runs in the 45-acre Indigenous Eyes Ecological Park, a large oasis of land in this eastern end of the Dominican Republic. This part of the island looks just as it did when when New York labor lawyer Theodore W. Kheel flew over it 35 years ago in a plane piloted by Dominican entrepreneur Frank Rainieri. The roads were dirt and the nearest airport was a bumpy eight-hour ride away. But the beaches were pristine — miles of white sand protected by a five-mile-long barrier reef. The few who lived at the eastern end of the island fished, raised sugar or cattle, or burned trees for charcoal. There was neither indoor plumbing nor electricity, and most of the locals were illiterate. “It was a lawless, cowboy place, like the wild, wild west,” says Kelly Robinson, director of environmental and social affairs for Grupo Punta Cana, the Dominican/American partnership Kheel eventually formed. Kheel, whose passionate environmentalism informed his practice of labor law, saw the potential to protect the land and employ its people. After bringing in a few partners, he bought 15,000 acres of scrub, three miles of it along the shoreline. They built eight simple cabins and planted 2,000 coconut trees, and in doing so planted the seeds for the luxurious 420-room Punta Cana Resort and Club, arguably one of the most environmentally and socially conscious resorts in the Dominican Republic. From the beginning, Kheel and his partners were intent on avoiding the high rises, over crowding and pollution that mar so many resort areas. In Punta Cana, the law prohibits buildings taller than the palm trees, and the resort — built of native coral, wood and cana branches — is so low-density that each guest is afforded 575 square yards of space, even in peak season. 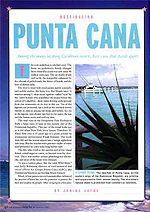 The development happened in increments, and it didn’t take off until 1984, when GPC and the nearby Club Med opened the Punta Cana airport, the first privately-owned airport in the world, which brought in 2,000 people that year and now brings about 1.3 million annually into the area. Both the airport and the resort have been refurbished and rebuilt after being battered by hurricanes, and each reincarnation has been another opportunity to get it right, another chance to balance protecting the land with the inevitable side effects of tourism. There is always a push and pull, though. The airport has brought thousands of jobs to the area, but it also has opened the way for less-environmentally-concerned developers to slap up shoulder-to-shoulder hotels that do little to respect the land. Still, GPC itself is doing a great job, says Robinson, who worked during the 1990s as director of the Caribbean Alliance for Sustainable Tourism, an initiative of the Caribbean Hotel Association. She points out that GPC also helps coordinate regional forums for discussion of conservation, and has enlisted the help of both American and Dominican universities through the biodiversity center. They also are constantly reevaluating what they’re doing, and how they can do it differently. The P.B. Dye-designed course, for example, has four holes along the water, and another 14 with water views. It is planted in seaside paspalum hybrid grass, which can be watered with a combination of salt water and so-called gray water recycled from the resort. It requires about half as much fertilizer and pesticide than it would if it had been planted with traditional Bermuda grass. But the runoff from those chemicals seeps into the ground water, which flows into the ocean, which causes algae to grow. That algae kills segments of the reef. Portions of the reef are still beautiful, though, as I had learned earlier, drifting along in a mask and snorkel. Parrot Fish, Blue Tangs, Butterfly Fish, and a slew of others dart through the clear water, oblivious to the human overhead. For a long time, humans — especially visitors — were oblivious in return. Scuba divers broke off pieces of the reef, and skiers knocked out chunks with their motor boats. For decades, native fishermen used nets and dynamite, both of which shatter segments of the reef. And vacationers encourage the fishermen by splurging on lobster, not realizing that lobster eat snails that harm the reef, and without the lobster to keep their population down, the snails proliferate, killing the reef. GPC recognizes that protecting the living reef is vital to tourism in the area, not just because it’s beautiful, but because it is what both protects and re-creates the beach each day, and because it is home to the fish that feed the guests. So it pushed the government to create no fishing zones, and it’s working with local fishermen to help them see that protecting the reef is in their best interests, too. Working with the Dominican navy, GPC also sunk a 220-foot cargo ship, creating an artificial reef that protects the existing reef and creates a haven for barracuda, snapper and green eels. GPC also is bringing in experts to explore the possibility of creating coral gardens that could be used to replenish the reef, much like the resort’s nurseries are used to nurture and then re-use native plants and trees harvested from construction sites, and its organic vegetable, fruit and spice gardens — all irrigated with water recycled from the resort — are used to supply its buffets. What the resort nurtures best, though, is tranquility, and it is that I notice as I wend my way out of the park to the beach, where a smiling Dominican man brings me a drink made with the wonderful local rum, Barcelo Anejo. The smell of grilled sea bass — pescado al brochette — drifts past, but it’s not yet time for dinner. For now I want to wander aimlessly into the still blue waters, crabs scuttling away underfoot. At this resort, I don’t have to think about anything. I can let my mind drift in blessed silence. There is no mosquito-like whine of jet skis, no fear of motorboats slicing into the swimming area, nothing but peace. I drag a Sunfish into the water and tack off across the lagoon — a skill I learned just this morning — the better to watch the sunset. Thirty miles up the beach there is a cluster of 30 or so hotels, the beaches rife with motorboats and parasailers and bartering vendors. I can go there tomorrow if that’s what I need. But here I have room to just be quiet. Here I could rent a beachfront house designed by Oscar De Larenta, one of the members of GPC, but I wouldn’t be able to walk out on the attached segment of sand because it is a protected spawning ground for sea turtles. That’s typical of GPC, which in 1994 established the Punta Cana Ecological Foundation with an endowment of 2,000 acres for a nature reserve. In 1999 it opened the Cornell Biodiversity Laboratory, where researchers from Cornell, Columbia, Harvard and other American and Dominican universities assay and inventory native plants, insects and birds. I pass a group of students from Virginia Tech who are working in the palm garden, home to 20 of the 40 or so native palm species. They are learning about sustainable development, or the idea that it is unjust for developers to deplete the land so future generations can’t meet their own needs. A few miles away their peers are negotiating details for Virginia Tech’s efforts to build and staff a healthcare clinic in a nearby town. It’s part of an effort to protect the environment’s most important assets, its people. Not much farther along I stop in the shade of a palm tree next to a stone and thatch barn, as a Dominican cowboy named Miguel saddles horses. From there we ride out, down a dirt back road, ancient palms brushing our legs, my horse responsive to body movements, although less so to English. Miguel, who says his English is very bad, smiles as I confess to knowing only un poquito espanol. He happily practices with me as we ride along the beach, past willowy Abercrombie & Fitch models posed for a photo shoot. His job, he says, is wonderful. He gets to care for the horses, to meet people from all over the world, to gallop across the sand. If not for the tourism boom, he would not have this opportunity. He would not be spending his Saturdays at school, learning English. Indeed, there wouldn’t be a school. The 14-room private school filled with books and computers and science labs was built by GPC, which also pays its teachers. There, landscapers’ kids sit next to their bosses’ children and grandchildren, breaking a tradition of separation between social classes. Tuition is based on a sliding scale, so the least skilled employees pay about $4 a month, while top executives pay $110. Last year GPC built a high school, and it has committed to building a new public school for the neighboring community of Veron. Miguel and I stop talking, though, as our horses break into a gallop across the beach that barely separates the golf course from the sea. The palms bend in a wind that snatches away my laughter. It is a glorious beginning to a day that will include windsurfing and another visit to the sweetwater lagoon, as well as long quiet hours reading on the beach. Tonight I will watch the sun set from the balcony of the restaurant Anani, where the black bean soup will be paired with flatbread and a glass of red wine, followed by mahi mahi served on a bed of avocado and potato slices, then a selection of mousses and macaroons and triple chocolate cake. After, I’ll wander over to the beachfront theatre, sit back with another Barcelo Anejo, and watch the native dancers, feet and skirts flying, as the evening breeze drifts in from the sea. I will hear their music even as I drift to sleep. It is the music of sugar cane and cattle, of tobacco and charcoal, of tides and hurricanes and slow beauty. It is the music of a people with a rich past, and, with care, a richer future.